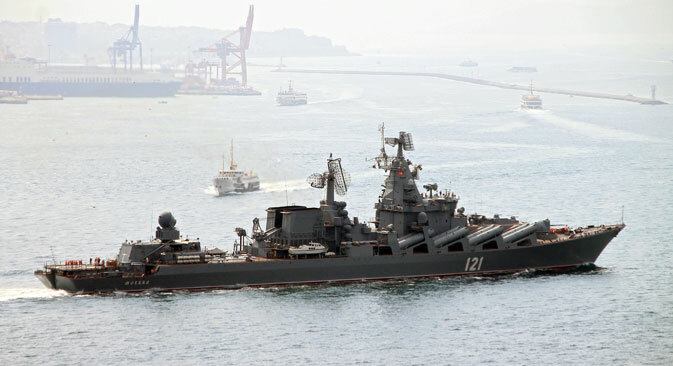 The guided missile cruiser “Moskva” has deployed near the Syria-Turkey border to defend Russian aircraft participating in the military campaign in Syria from any aerial threats following the recent incident involving the downing of an Su-24 plane by the Turkish air force. RBTH presents 10 facts about one of Russia’s most powerful vessels. 1. The Moskva is the lead ship of the Russian navy’s Project 1164 Atlant class of guided missile cruisers. It was laid down in 1976 in a shipbuilding plant in Nikolayev (Ukraine) and named Slava ("Glory"). 3. The Project 1164 cruiser has sometimes been referred to as an “aircraft carrier killer,” probably inspired by the 16 SS-N-12 Sandbox anti-ship missiles mounted on the superstructure. 4. It was used by the USSR delegation during the Malta Summit (Dec. 2-3, 1989) between Soviet leader Mikhail Gorbachev and George H.W. Bush. Stormy weather and choppy seas resulted in some meetings being canceled or rescheduled, and gave rise to the moniker the "Seasick Summit" among international media. 5. The Slava was recommissioned as the Moskva in April 2000, and replaced the Admiral Golovko as the flagship of Russia’s Black Sea Fleet. 6. The crew of the Moskvaenjoy all that is needed for a normal life and rest during long periods at sea – television and radio centers, medical unit, library, cinema room, laundry, bakery, hair salon, gym and even a sauna. 7. The raised flight deck on the stern allows the operation of a Ka-25 or Ka-27 helicopter, both developed for ferrying and anti-submarine warfare. This clash took place during the Russo-Georgian War of 2008 when, according to the Russian Ministry of Defense, four Georgian fast missile boats attempted to breach a "security zone" that had been pronounced around Russian navy ships off Abkhazia, which media claimed were blockading Georgia’s coast. In response, the Russian units fired on the Georgian boats with artillery. One boat was sunk and the other three were forced to withdraw. The skirmish was the Russian navy’s first real marine battle since 1945. 10. The Moskva cruiser can cover all of southern Turkey from Latakia, making sure that from now on Russian planes are safe in the air.